Few things spark more excitement for children and adults as well than going to a Disney World theme park. There is something so completely magical about the entire experience that just speaks to me, especially now as a mom. When we started planning our vacation, I read all the articles and researched as much as I could before finalizing our itinerary, but honestly after experiencing it, I would have changed and added a couple things during our trip to make the process of experiencing Disney World with a toddler run more smoothly. When I have visited the parks in the past, I have planned almost every moment and tried to squeeze as much fun and as many experiences out of each day as possible. This is NOT a good idea when you have a toddler with you! Planning lots of free time will minimize meltdowns in the parks. If you plan to stay on a Disney resort you will have a free and convenient shuttle to and from your hotel. Utilize this perk to head back to your resort mid-day for a nap and some lunch. Allowing your child this short break will ultimately make the entire day run much more smoothly. Each of the parks are incredibly over the top with all things sensory, this is what makes them so incredible! However it can be overwhelming to some children in large doses, so schedule in some free time, and check out those amazing pools. This is a tough one, and what we struggled with the most when preparing for our vacation. We ended up bringing our own stroller with us, and it was the best decision ever! Although it was a pain to bring along on our flight we were super happy to have it in the airports, as well as the parks. There are strollers available for rent at the parks, but they are expensive, and not very comfortable. It was very easy to bring our own stroller along on the shuttle and it provided us much more storage space for bags and drinks than the ones available for rent, we were also more easily able to find it in the stroller parking area. We also brought diapers, wipes and sunscreen with us thankfully as these items were extremely expensive to buy on site. I will be adding some dry snacks for our next trip to curb all those toddler snack needs as well as a refillable water bottle. Water and snacks were expensive, and we could have saved a lot by bringing those items. We were able to reserve a portable crib for our room, so feel free to leave the pack and play at home. Also, if staying on a resort all shampoo, conditioner, and body wash for adults is included in your room, but if your child needs a specific kind, or something for sensitive skin, you will need to bring that with you. Another item we brought was almond milk boxes, as our daughter is allergic to milk. They do have soy milk at specific locations, but we preferred almond milk, and it was not available, so ask ahead if your tot has any allergies. We focused mostly on experiences while we were there. Our toddler was too little for many of the rides, but she enjoyed the kid’s area a lot. It also has a small splash pad in the Magic Kingdom park, so remember to bring a swim suit, or change of clothes with you into the park. Meet and greets with the characters, shows, and plays were popular with her age group. Of course the restaurants and gift shops were a huge hit with her as well, and a great way to get out of the heat for a few minutes, and get some fantastic treasures. If you are hoping for a particular restaurant or experience make sure to have a reservation, as they are almost always full. Story time with Belle in Magic Kingdom is another great experience for toddlers. You can also request a button for your child if it is their first visit, or birthday, or special event and often your child will receive special treatment or recognition. It’s just another way Disney World goes above and beyond. 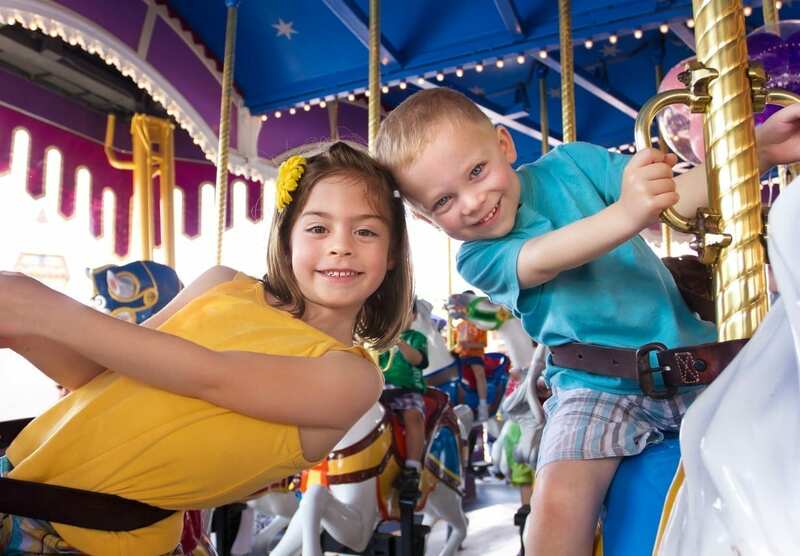 Some family rides you may want to avoid in Magic Kingdom would include Pirates of the Caribbean, and Aladdin’s magic carpets. Although these rides are for families, and toddlers are allowed to ride, in my experience Pirates of the Caribbean has moments of complete darkness, and is not very age appropriate, and Aladdin’s carpet ride was not very secure. My daughter is small for her age, and would have easily fallen out if not for me holding her in, even with her seat bar. Some other attractions that are great for toddlers include T-rex Café in Disney Springs as well as the shops there, Bibbidi Bobbidi Boutique is located in Disney springs, as well as Magic Kingdom, but is only available to kids 3 and up. Also, the incredible Frozen ride at Epcot is worth seeing with your tot. Overall, Disney World can be one of the most incredible places to visit with your toddler, seeing the magic through their eyes is really something to experience! Good planning and preparation can make everything run much smoother when introducing your toddler to the most magical place on earth!